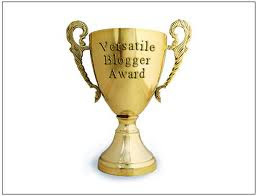 BeautyFul World: Blog Of The Week and Versatile Blogger Award! Last week was full of awesomeness for my blog. Lovely Kimmi at What Kimmi did next… featured my blog as her weekly favorite. I am so glad she likes my reviews. I try my best to make them helpful for you guys. Make sure to have a look at her blog, I love her fashion style. Another lovely blogger Kristin at Meet me on the Bright Side awarded me Versatile Blogger Award. Thank you so much, sweetie! It makes it feel so good to know someone enjoys reading my rambles and randomness :). You must Thank the person who gave you the award, including a shout out with a link back to their blog. Send the award to 10 other bloggers whose blogs you love and let them know about it. Hey thank you for tagging me. :] My toes are like that too! America is like each state is a different country :) Whereas in Europe you have to go to a different country to be in a different country ha ha.